The key signature at the beginning of a musical staff lists the sharps or flats in the key. 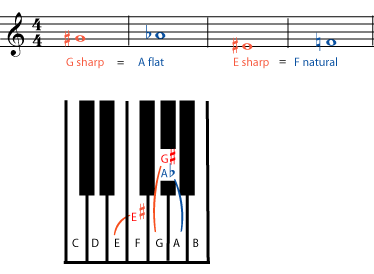 In musical notation, a key signature is a series of sharp symbols or flat symbols placed on the staff, designating notes that are to be consistently played one semitone higher or lower than the equivalent natural notes (for example, the white notes on a piano keyboard) unless otherwise altered with an accidental. Key signatures are generally written immediately after the clef at the beginning of a line of musical notation, although they can appear in other parts of a score, notably after a double bar. The key signature comes right after the clef symbol on the staff. It may have either some sharp symbols on particular lines or spaces, or some flat symbols, again on particular lines or spaces. If there are no flats or sharps listed after the clef symbol, then the key signature is “all notes are natural”. In common notation, clef and key signature are the only symbols that must appear on every staff. They appear so often because they are such important symbols; they tell you what note is on each line and space of the staff. The clef tells you the letter name of the note (A, B, C, etc. 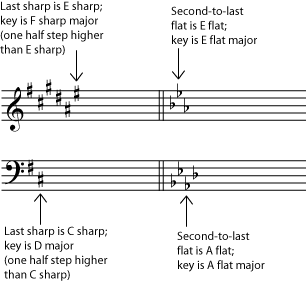 ), and the key tells you whether the note is sharp, flat or natural. This key signature has a flat on the “B” line, so all of these B’s are flat. The sharps or flats always appear in the same order in all key signatures. This is the same order in which they are added as keys get sharper or flatter. For example, if a key (G major or E minor) has only one sharp, it will be F sharp, so F sharp is always the first sharp listed in a sharp key signature. The keys that have two sharps (D major and B minor) have F sharp and C sharp, so C sharp is always the second sharp in a key signature, and so on. The order of sharps is: F sharp, C sharp, G sharp, D sharp, A sharp, E sharp, B sharp. The order of flats is the reverse of the order of sharps: B flat, E flat, A flat, D flat, G flat, C flat, F flat. So the keys with only one flat (F major and D minor) have a B flat; the keys with two flats (B flat major and G minor) have B flat and E flat; and so on. The order of flats and sharps, like the order of the keys themselves, follows a circle of fifths. The key signatures with seven flats and seven sharps are very rarely used, not only because pieces in these “extreme” sharp or flat keys are more difficult to play on most instruments, but also because they have simpler enharmonic equivalents. For example, the key of C# major (seven sharps) is more simply represented as Db major (five flats). For modern practical purposes these keys are the same, because C# and Db are the same note. Pieces are written in these “extreme” sharp or flat keys, however: for example, Bach’s Prelude and Fugue No. 3 from Book 1 of The Well Tempered Clavier BWV 848 is in C# major. However, the aforementioned 15 key signatures only express diatonic scales (and are therefore sometimes called “standard key signatures”). Other scales are written either with a standard key signature and use accidentals as required, or with a non-standard key signature, such as the Eb (right hand) and F# & G# (left hand) used for the Eb diminished (Eb octatonic) scale in Bartók’s “Crossed Hands” (no. 99, vol. 4, Mikrokosmos), or the Bb, Eb & F# used for the D Phrygian dominant scale in Frederic Rzewski’s God to a Hungry Child. The effect of a key signature continues throughout a piece or movement, unless explicitly cancelled by another key signature. For example, if a five-sharp key signature is placed at the beginning of a piece, every A in the piece in any octave will be played as A sharp, unless preceded by an accidental (for instance, the A in the above scale — the penultimate note — is played as an A# even though the A# in the key signature is written an octave lower). Generally, if there is only one sharp, it must be F sharp; the sequence of sharps or flats in key signatures is rigid in music from the common practice period. The order is set out below. In the 20th century composers such as Bartók and Rzewski (see below) began experimenting with unusual key signatures which departed from the standard order. In 15th-century scores partial signatures are quite common, in which different voices will have different key signatures; however, this is derived from the different hexachords in which the parts were implicitly written, and the use of the term “key signature” can be misleading for music of this and earlier periods. A key signature is not the same as a key; key signatures are merely notational devices. They are convenient principally for diatonic or tonal music. Some pieces which change key (modulate) insert a new key signature on the staff partway, while others use accidentals: natural signs to “neutralize” the key signature and other sharps or flats for the new key. For a given mode the key signature defines the diatonic scale that a piece of music uses. Most scales require that some notes be consistently sharpened or flattened. For example, in the key of G major, the leading-note is F sharp. So the key signature associated with G major is the one-sharp key signature. However, there is no causal connection; if you see a piece with a one-sharp key signature, you cannot be certain it is in G major. 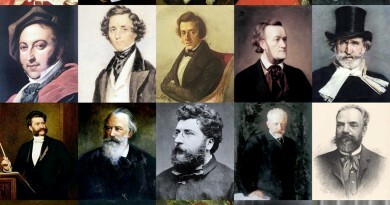 Many other factors determine the key of a piece. This is particularly true of minor keys. The famous “Dorian” Toccata and Fugue by Bach is so named because, although it is in D minor, there is no key signature, implying that it is in D Dorian. Instead, the B flats necessary for D minor are written as accidentals as and when necessary. Two keys which share the same key signature are called relative keys. When modes, such as Lydian or Dorian, are written using key signatures they are called transposed modes. For more than one flat, the (major) key is the next-to-last flat. For any number of sharps, take the last sharp and go up one semitone to get the (major) key. 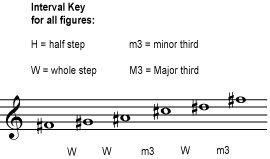 (The relative minor is a minor third down from the major, regardless of whether it is a “flat” or a “sharp” key signature). For key signatures with sharps, the first sharp is placed on F line (for the key of G major/E minor). Subsequent additional sharps are added on C, G, D, A, E and B. For key signatures with flats, the first flat is placed on the B line, with subsequent flats on E, A, D, G, C and F. A common mnemonic for remembering this is Father Charles Goes Down And Ends Battle (or Fat Cats Go Down Alleys Eating Birds) for key signatures with sharps, and vice versa for key signatures with flats: Battle Ends And Down Goes Charles’s Father. There are 15 possible different key signatures, including the “empty” signature of C major/A minor. This sequence is rendered in the circle of fifths. The use of a one-flat signature developed in the Medieval period, but signatures with more than one flat did not appear until the 16th century, and signatures with sharps not until the mid-17th century. 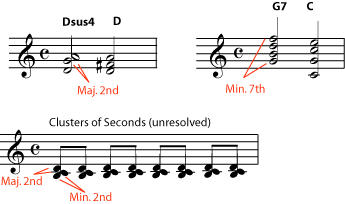 Baroque music written in minor keys often was written with a key signature with fewer flats than we now associate with their keys; for example, movements in C minor often had only two flats (because the Ab would frequently have to be sharpened to A natural in the ascending melodic minor scale, as would the Bb).